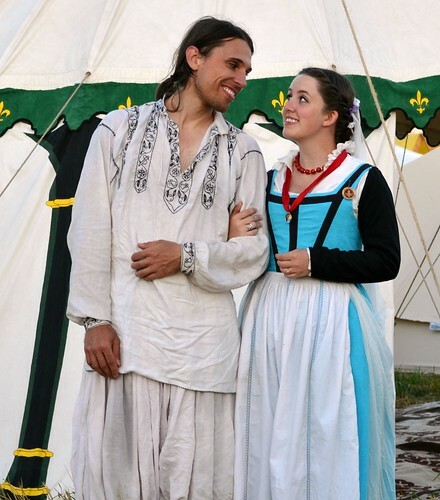 There is something so lovely about shirts, smocks, shifts, camicie, and chemises. All of those words really just mean ‘shirt’ and refer to the white linen garment worn nearly universally across Europe next to the skin before the 17th century (and after that too, but we’re only interested in the before today). I think one of the things that makes them so lovely is how simple they are. As fashion goes towards more and more complex shapes and patterns for doublets, gowns, pants, and so on, the shirt remains so nicely geometric! All rectangles and squares, plus a triangle or two for fun. 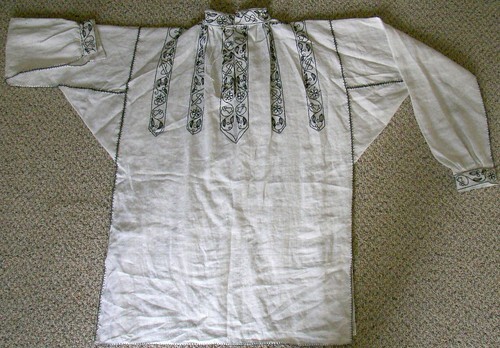 Men’s shirt pattern. All you have to do to make it a woman’s pattern is add a pair of long triangles on either side of the main body piece, giving you a bit more room for the hips, and instead of ending the shirt at mid-thigh, aim for knees or below. Isn’t that so nice and simple? 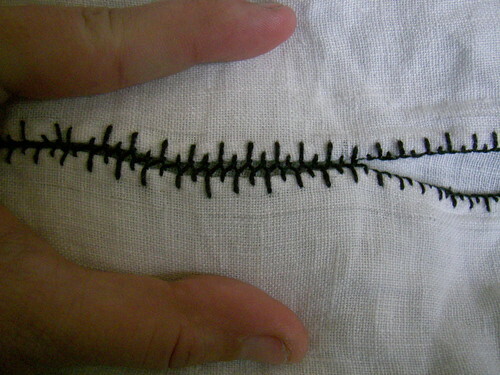 That simplicity makes it a wonderful beginner’s sewing project, since the measuring is very direct and understandable. You want the cuff to go around your wrist? Well measure your wrist and add an inch so it isn’t uncomfortably tight. Easy! I think that a project like this is perfect for starting to understand how to draft out a pattern yourself, just using measurements. 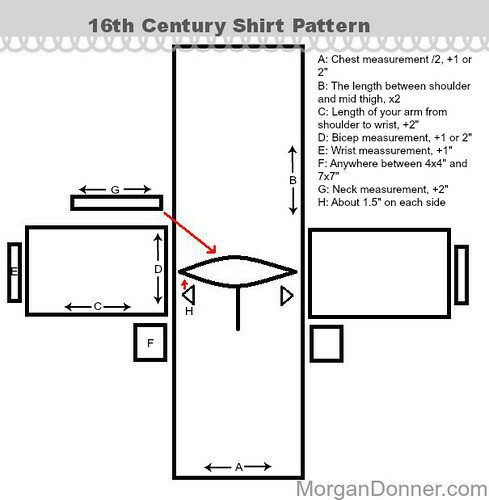 I’d say the only bit to remember that is not very apparent on the diagram is that the narrow slit for the neck should go a few inches forward from the center of the body piece. The human neck is placed forward on the torso, not directly on top. I am sure you have noticed how your T shirts all have neck holes placed more on the front of the shirt than on the back? If the neck hole were directly at the top of the shirt, evenly placed between back and front, you’d end up with a very uncomfortable shirt! It will feel a bit like it is choking you all day. I myself need to remember this because every time I make a new shirt, I catch myself starting to mark and cut the exact middle before I remember “Wait, no, don’t do that. Put it forward a few inches!”. Now not all shirts are exactly the same. The pattern above is for a high necked version, but low necked versions are also very common and they are just as wonderfully geometric! These ladies are a perfect example of low and high necked shirts, sometimes worn with the exact same style of gown! But for now, let’s just talk about the high necked style. You know what else I find lovely about shirts? There are a ton of extant examples to look at! Embroidered linen with silk, England, 1540. Here’s a goodly number of shirts that have survived the last 400 years, mostly labeled as men’s shirts. I think that because pretty embellished partlets became so popular in the late 16th century, there were a lot of women wearing a low necked shifts with a partlet, rather than a high necked one, which would look sort of silly with a partlet. But while the ladies high necked shift is less common than the man’s version, they certainly existed. My love of shirts made itself known to me last year when I received a copy of Janet Arnold’s Patterns of Fashion 4 as a gift. It’s a lovely book, full of detailed pictures and measurements of various linen underclothes from around 1500-1630, including many of the shirts linked above. This new (to me) source of information inspired an idea; I decided to make a secret birthday gift for my other half. He had a few shirts, but no linen ones yet, and certainly none that were embroidered. I liked the various embroidery designs that involved vertical lines down the chest and sleeves. After glossing over the various extant pieces again, I decided I would go for the scrolling vine-like design that seems so common, but instead of coping one of the many flowery shapes exactly, I put in elements a little more personal to my Mr. He likes coffee, so I added coffee berries and flowers. We both have ermine in our SCA heraldry, so I added an ermine-flower, and I added a threaded needle from my own device. 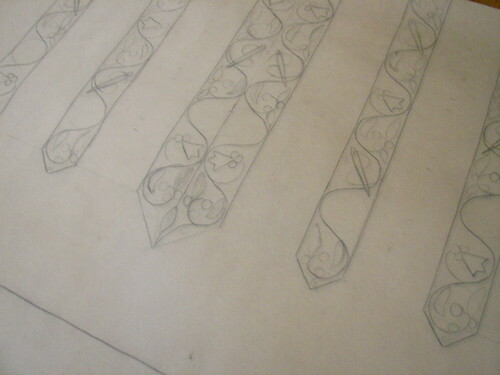 With these four elements in mind, I drew up a full size pattern of the body piece and sleeve pieces, placing the embroidery design on the pattern in the size and locations that looked best. 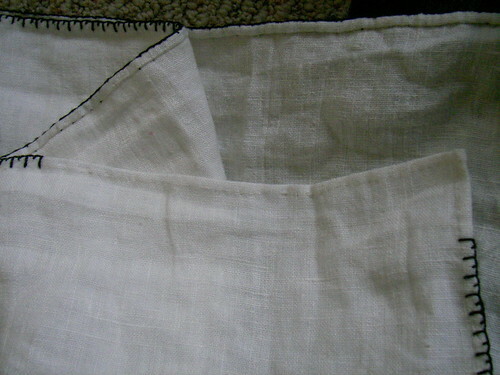 With all my pattern pieces cut out of linen (using an older shirt of his that I knew fit as a guide, since this was a surprise gift and I couldn’t just measure him), I started hemming each piece of the shirt separately. The extant shirts look like they have been hemmed, and attached to each other with a fagoting stitch, which is sort of like a buttonhole stitch that goes back and forth between the two fabric pieces. It looks like there are several variations to choose from, with decorative knots or smaller and bigger stitches, I did a test on a scrap of fabric to find the one I liked best and then went to town on the shirt. I went pretty simple with my fagoting stitch, just buttonhole back and forth, with short and long stitches for visual interest. The thread I am using here is a silk thread I got from an SCA vendor, but it might have been a bit too big and fluffy for this purpose. If I were to do something like this again, I’d use a much smoother thread. On parts of the pattern that didn’t need to be attached to another, like the bottom hem, I just continued using a buttonhole/blanket stitch. Remember the little triangles on the pattern at the beginning of this post? Here is how they look when sewn into the neck of the shirt. Without the triangles, that point is a bit awkward to gather into the collar, and has a bit too much stress, causing rips later. 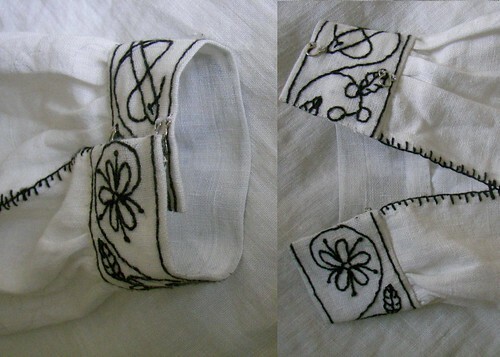 I used the same embroidery pattern on the cuff and collar, continuing the same scrolling vine. The cuffs came out a little bit too big, but that’s nothing that a little overlap won’t cure. I really should have ironed before this picture. As you can see, I ran out of time to do the embroidered lines down the length of the sleeve like I had originally planned. As it was, this took too months of stitching during almost all of my classes (I couldn’t work on it at home, could I?). But even with the sleeves bare, the Mr. liked his new fancy shirt, and wears it often. Thank you for all the information on this site. 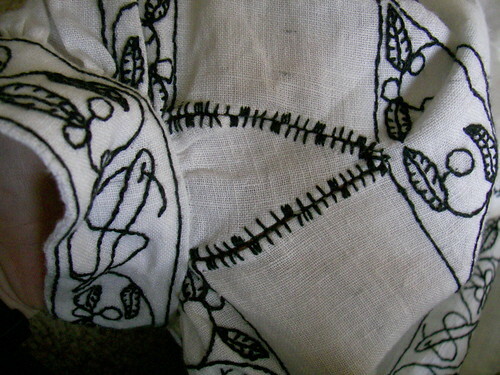 I am a beginning sewer and I make my own garb for the Valhallas Pirates. Ah! So that’s why my collars never sit right. 1 Pings/Trackbacks for "16th Century Shirt"